Throughout history, many citizens have struggled using different techniques to convey a message and achieve their ultimate goal, justice. Justice is defined differently to each and every one of these individuals such as expanding one’s human rights, reaching equality, and/or closure to one’s family. There are various ways to fight for justice: going to the streets and protesting, writing letters to those of higher authority, using media, and simply and effectively enggaing art. One image, one song, or an essay has the power to influence many and motivate them to unite to achieve justice. Las Cafeteras (the coffeemakers), is a recent music group that is based in Los Angeles, California. All members are university students that decided to form a music band using the power of music with the free verses to highlight all the issues they witnessed living in Los Angeles: drugs, violence, and other issues. Las Cafeteras is a band that with their music hopes to raise awareness and motivate those that have been touched by their music to become involved with social justice. Compared to many other band, Las Cafeteras have been around for about six years and are gaining publicity with their concerts, websites and social media. 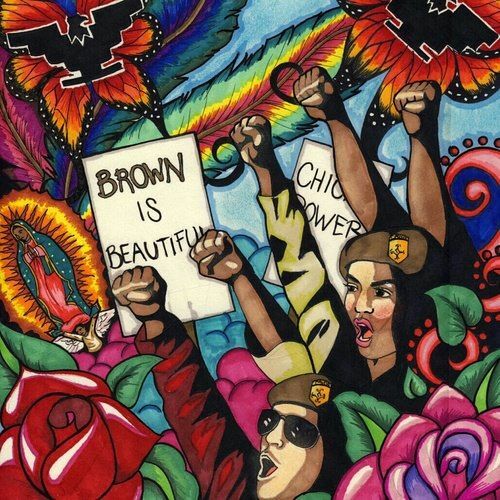 Before my discovery of Las Cafeteras, I believed that the only correct way of bringing social justice was through riots and protest which have been used throughout history, but I was wrong. Music, art, theater, and other infinite ways exist to cause social justice because it's all about spreading the word, knowledge and prompting people to make change. After briefly listening to a conversion amongst my sister and my friends discussing Las Cafeteras, I began wondering about their work and began conducting a little research to learn more about their missions for the future. No matter where in the world one resides, there is always crime. Growing up between two very different places, New York City and Matamoros, Coahuila, I have heard of the crimes committed ranging from “getting mugged” on the streets to having cartels taking ownership of family businesses. Las Cafeteras composes music that exposes all of this crime that happens in their hometown; they enable plenty of individuals to relate because it just takes a look outside your window to notice the issues that lie on the streets. Despite the fact that crime exists everywhere, it is in our hands and in the hands of the future generations to get involved and fight for social change. These musicians, along with many others, have begun the journey to enlighten many about the issues and have directed us towards ways of change. Las Cafeteras has altered the way in which I perceive the world and the possibilities that exist to make a difference, at least in my community. Sharing their music with the world, ﻿Las Cafeteras has their own website that provides background information about each member in the group and their contribution to the music. Additionally, Las Cafeteras has various means of communication via social media. To better understand this group, one can listen to their music and interpret the lyrics to better understand the musicians and the issues within their communities. Listening to their music and following the Tweets and Instagram and Facebook posts will allow you to understand and learn the power music upholds and how it is utilized to achieve social justice, starting with one’s own community.